Discussion in 'How is your display put together...' started by vincerules, Jun 25, 2013. I did this yesterday, I ended up using some acrylic I had laying around to mount everything to. The power supply & P2 are mounted using industrial strength velcro. Besides maybe putting in some better strain relief, does anyone have any suggestions to improve my design? I have 3 more to do. Looks Nice I need to get moving on finding boxes and get them wired up also. I like the power injection strips. I hope you have binding straps or some type of wire supports to keep from tugging on those cords. Looks pretty nice. Without knowing what you are driving I have no idea how much heat and current is involved in that box. Here in Aussie where it is hot at Christmas and not backwards like it is way north of here it is virtually a necessity to ventilate enclosures. I can't really tell what wire size you have used from the power supply to your distribution strips but I would ensure that it is big enough to carry the full load current of the power supply. Also related to current, you haven't got any fusing there. If you have a problem with any of the wiring on the output plugs the only protection you have is the over current protection of the power supply. If it is a 5V supply then it will current limit at about 70A. If it is 12V then it is going to current limit at about 30A. Both of these currents are well above the rating of the Ray Wu plugs and the wires. Really you should have a fuse in there somewhere to limit the current down to something acceptable but the best option would be to go with a fuse per output if you could justify that. Also related to current, you haven't got any fusing there. If you have a problem with any of the wiring on the output plugs the only protection you have is the over current protection of the power supply. If it is a 5V supply then it will current limit at about 70A. If it is 12V then it is going to current limit at about 30A. Both of these currents are well above the rating of the Ray Wu plugs and the wires. Really you should have a fuse in there somewhere to limit the current down to something acceptable but the best option would be to go with a fuse per output if you could justify that. I am ready to work on this again, is it as easy as just puting a fuse and putting it inline with the +12 connection to the power supply? Or is there more involved? Did you get any more information on the fuses for your power distribution? I read this post and did some research myself and was hoping someone would expand on this information. It's very rare to find anyone's enclosure that has any noticeable fuses. I did see one but the picture was to small to see how they set it up. From what I understand (and I may not understand) you would need a fuse from the PS to the ECG-P2 +ve and a fuse from each pigtale off of the power strip. The fuses should be slightly larger than your total calculated amp usage. It would be great is someone had a visual aid on this to demonstrate how to set it up and calculate the power loads. 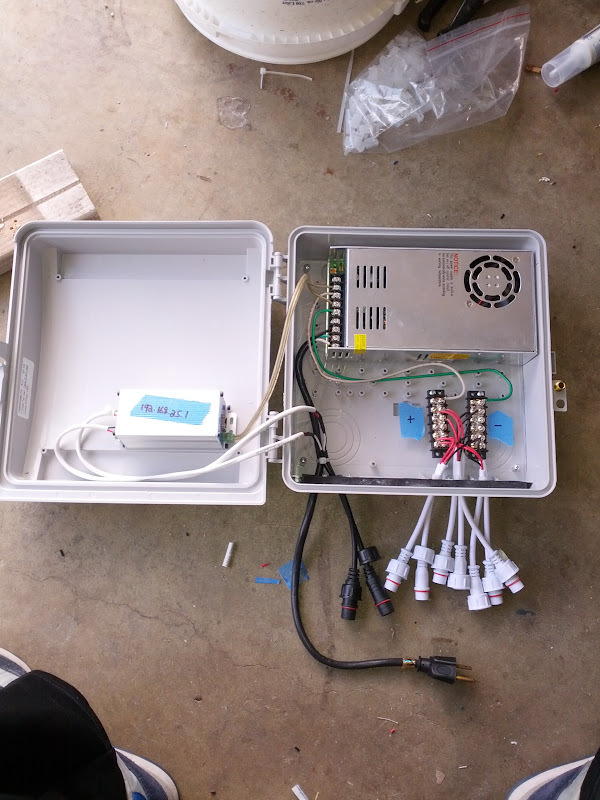 I will try and get a pic of my fused enclosure tomorrow. I run an inline blade fuse block with 6 fuses. I use 2 for power injection, one for the cooling fan, 2 for each side of my P12 inputs and one spare just incase I need it. i actually posted these same pics on another thread as well. here they are. took me a few hours but ll worth it once you know they are all protected and cooled. i run the cooling fan through a toggle switch on the underside of the enclosure and also through the fuse block.